The online exhibition of the 6th CPSA Explore This! is now online. 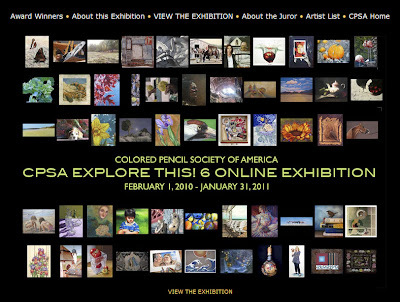 This is the Colored Pencil Society of America's exhibition which allows the use of coloured pencils with other media. As of last year, it became an online exhibition only - which lasts all year. Selected entries combined coloured pencils with watercolour, acrylic, gouache, ink, oil pastel, pastel, graphite, marker pens and metal leaf. Media supports included sanded travertine stone, a mahogany panel, wood and gesso. Collage was also used. The major change I noticed in the exhibition was that this year, there's more use of oil pastels in conjunction with coloured pencils. Ester's work is truly fabulous and unique. I had the pleasure of spending time with Ester and her husband Mario at the CPSA convention in Atlanta last year. They are wonderful people. I was also able to watch Ester demonstrate her methods on her heated board. For those fortunate enough to make it to California for the CPSA 2010 convention, Ester will be holding workshops that will offer instruction on her techniques. Each participant will have their own Icarus board to work on. Ottawa to California, humm...just how many airmiles do I have?? As for the Explore This show, each year I am looking for the work that truly explores. Once again there are many very realistic pieces that don't seem to be doing a lot of exploring. Sigh. Thank you, Katherine, for your kind words. I truly appreciate all you do for the art community at large and in particular for the colored pencil community. Your blogs are an excellent source of information and inspiration. 28th February 2010 - Who's made a mark this week? 21st February 2010 - Who's made a mark this week? 14th February 2010 - Who's made a mark this week? 7th February 2010 - Who's made a mark this week? Where do you start when making art?